Hello! 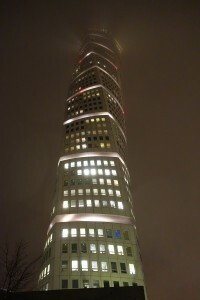 Further to Morten’s kind words of introduction, I’d like to take this opportunity to introduce myself as the new CTO of Dyalog Ltd.
I’m a newcomer to APL. When I started working for Dyalog in 2010 I had only seen the Game of Life video, an intriguing but baffling glimpse into a world of squiggles. But I soon got the opportunity to learn from some giants of the language, and came to appreciate the power and beauty of the notation. Later I learned that, despite its venerable history, the language is not set in stone; with care and attention we can develop and extend it to increase its power, relevance and performance, without sacrificing its elegance and simplicity. We — not just Dyalog, but the wider APL community — are guardians of a rare thing: a language born more than 50 years ago that is not just relevant and useful today, but groundbreaking in the way it embodies data parallelism from the ground up in a simple, consistent notation. Before working at Dyalog I spent 13 years developing compilers, optimisers and debuggers for more mainstream programming languages, including C and Java. This has given me a good insight into how to get the best performance out of modern computer hardware, and I’ve made it my continuing mission to help bring that level of performance to APL! Keeping the quality of the product as high as possible. Embracing new platforms and attracting new users. Improving our development tools, and making it easier to create and deploy new applications. Ensuring that Dyalog APL can interoperate smoothly with modern frameworks and services. Continuing to look at new ways of (carefully!) extending and improving the core APL language. I’m looking forward to working on this alongside the “new” CXO, Morten. At Dyalog we take a lot of care in the design of new features, and I firmly believe that a lively discussion between CXO (representing the needs of the customer) and CTO (representing the language designers and implementers) will only improve the quality of the designs we come up with. In the future I expect to spend a bit more time out and about, showing off Dyalog APL, and talking to all of you about your own needs and expectations of the product. In particular, this year I’ll be at DYNA16 in Princeton in April, and the Dyalog ’16 User Meeting in Glasgow in October. I look forward to seeing, or meeting, all of you soon! 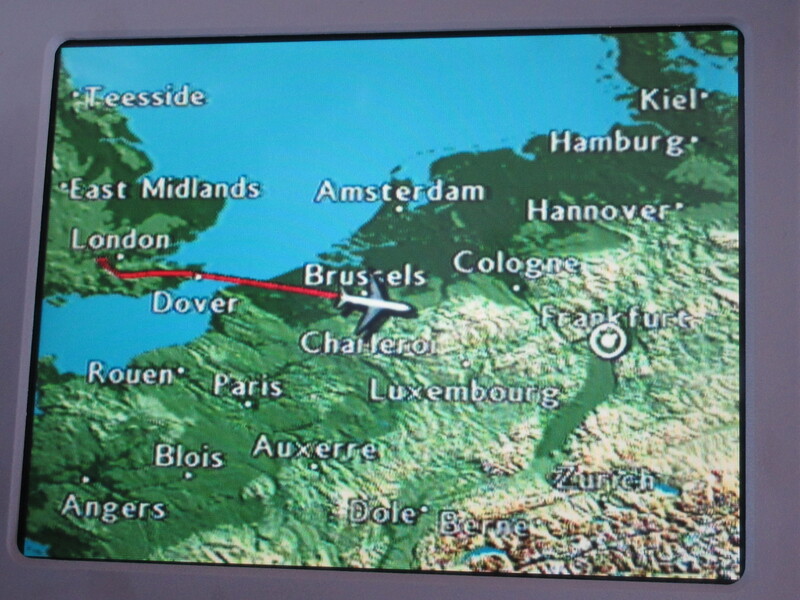 On Saturday afternoon we passed through London’s Heathrow airport for the third time in 5 days, this time continuing west to JFK, bringing the total for the week to 8,943km plus 300-odd in 3 different cars, 220 by rail, 25 by bus and 5 on the ferry 🙂 . Sunday was spent with some of Dyalog’s North American contingent, co-ordinating and putting the final polish on the coming week’s presentations. 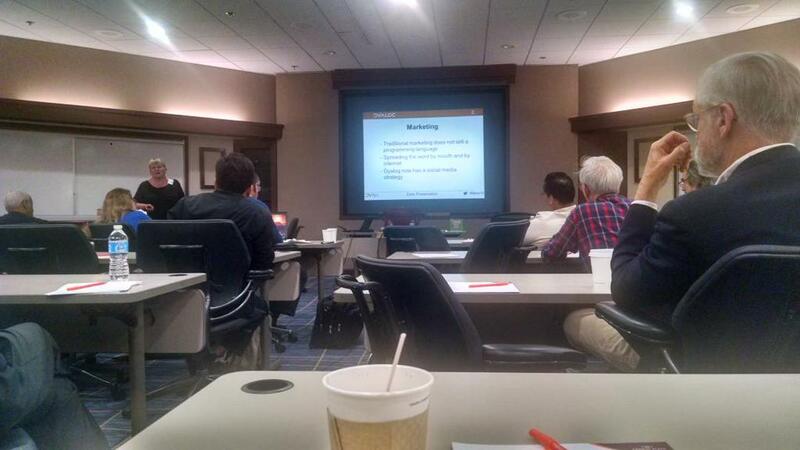 On Monday morning we were ready to start the first Dyalog North America user meeting – DYNA’15. 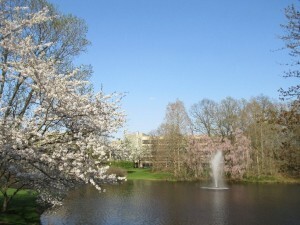 The Princeton Crowne Plaza was our venue – making this our third time there after Dyalog ’07 and Dyalog ’09. We had 37 visitors on Monday and 25 on Tuesday – a total of 45 different delegates representing about 15 different clients turned up to listen to updated road maps, demonstrations of new tools and four half-day workshops on Recent Language Enhancements, Parallel Programming using Futures and Isolates, Web Application Development and Modern APL Application Architectures. While there were no user presentations this year (the potential presenters seem to be keeping their powder dry for Dyalog ’15 in Sicily in September), we nonetheless had a full schedule. Woodley Butler of Automatonics, Inc had been due to make a presentation, but had a scheduling problem and was unable to come. 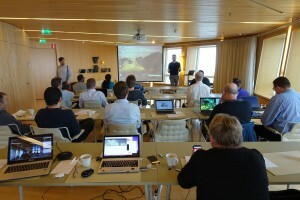 Gitte presented his exciting new hosting solution for Dyalog APL: APLCloud.com, during the opening session on Monday. Monday’s dinner may have been the highlight of the event. We traveled (longer than expected due to the shuttle driver getting lost) to Mimino’s Restaurant for an authentic Georgian meal. The word meal does not do the experience justice – it was a culinary extravaganza – with plate after plate of incredible Georgian food. Imagine everyone’s surprise when we were told that it was now time for the entrees! Good friends, good food and good drink made it a truly special night. After a meeting in Princeton on Wednesday morning we hit the road, again, this time to the Poconos to spend a few days relaxing and working with the North American Dyaloggers on a variety of projects before wrapping this tour up with visits to clients next Monday and Tuesday. 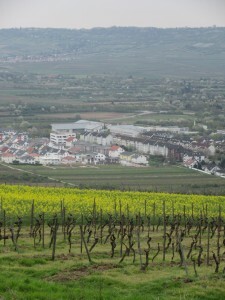 FH Bingen – must have good student parties? Job interviews done by lunch-time, and we hopped in the car (without lunch) to Heathrow, flew to Frankfurt and finally arrived at Bingen at sunset, just in time for some Weissbier and Flammkücken with the other early arrivals. Bingen is located west of Frankfurt, where the Rhine leaves the plains and bends north through hills, heading for Köln, Düsseldorf and the North Sea. 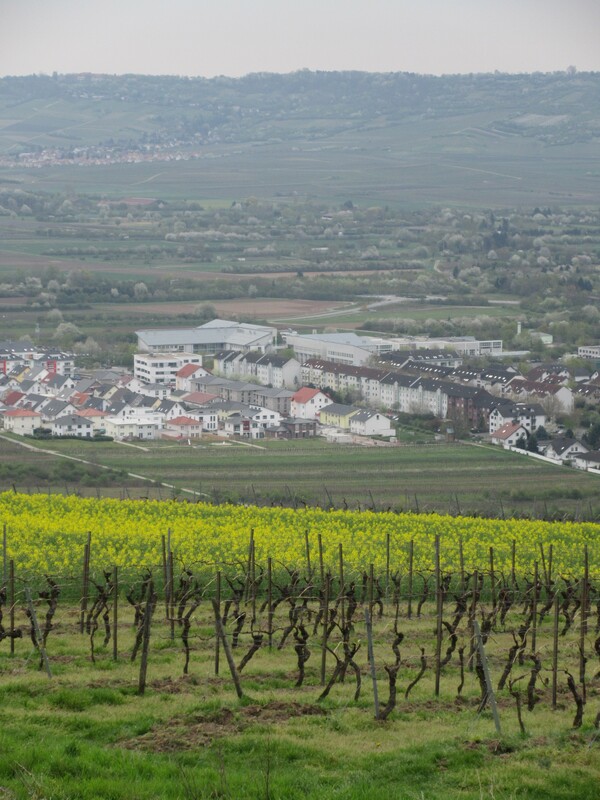 Separated from the river by a vineyard-covered hill lies Fachhochschule Bingen, where our, host Dieter Kilsch, uses APL with MatLab and other tools to teach students about quality control and other subjects. 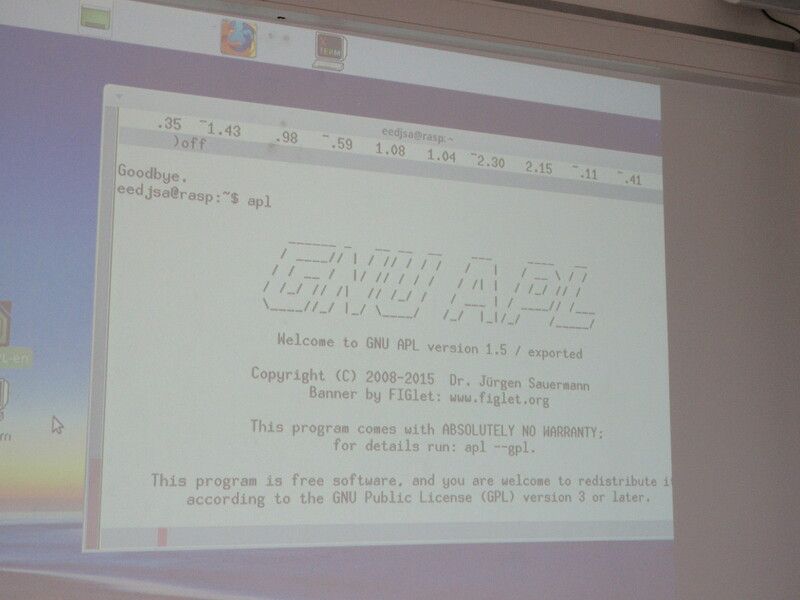 We spent the next two days in the company of about 25 German APL enthusiasts. This time we were first up with a 2.5 hour workshop on Futures and Isolates, and we were very pleased to see that all the delegates who had gone to the trouble of installing Dyalog APL were able to perform all the exercises. We’ll have to make them a little harder next time (Tuesday in Princeton) 🙂 . The afternoon was focused on IBM: News from the Z-series hardware front, and the IBM GSE requirements process, where APL2 users get together and vote on priorities for requests for enhancements. Wouldn’t it be great if our Dyalog users would gang up on us like that and help us to set priorities as a group? The first session on Friday was an APL Germany “business session” which we were allowed to skip. Morten discovered that the Tourist Information office next to our hotel rented bikes. They were a little shocked that he was willing to spend €13 for on hour on a bike, but he felt that he really needed to burn some carbon off the spark plugs. Seems he can’t see a hill without feeling it is necessary to make an attempt to get to the top of it. With Morten energised after an hour on the bike, it was time to return to the meeting. 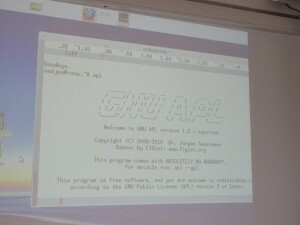 A couple of presentations were particularly interesting: before lunch, Jürgen Sauermann spoke about GNU APL, which is now 2 years old and up to version 1.5. It is very encouraging to see open source APL systems thriving and promoting the use of APL. We rounded the two days off with a presentation on our strategy and selected demos of features from versions 14.0 and 14.1: Key, the new experimental JSON parser/generator and the Compiler, threw ourselves in the rental car and headed to Denmark for 15 hours at home before we set off for JFK and Princeton. 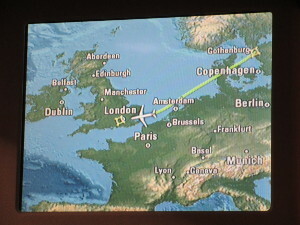 The story continues next week, on the other side of the Atlantic! 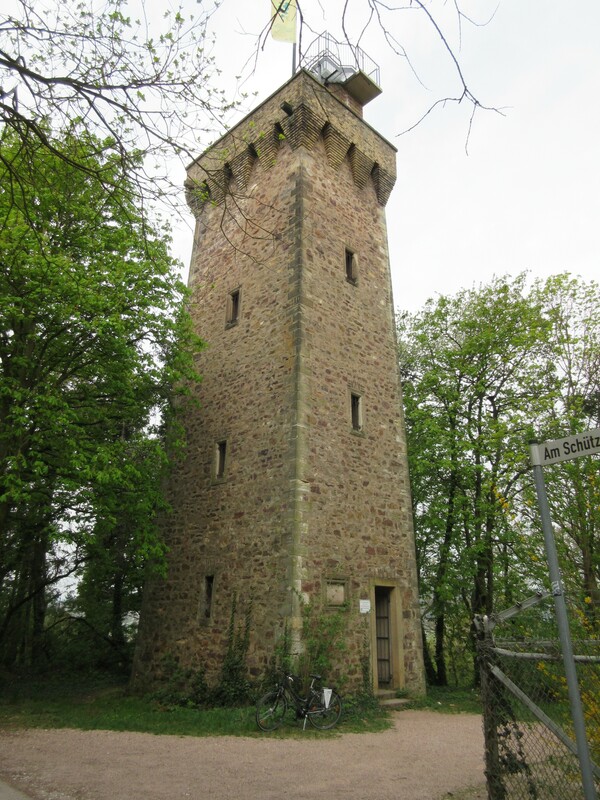 One of my favourite times of the year is the period in March/April where we traditionally start with a visit to the FinnAPL Forest Seminar followed by the APL Germany Spring Meeting. 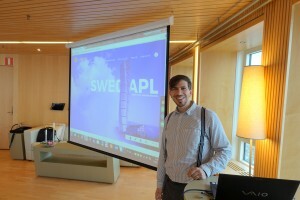 This year there are two new stops to make: the Swedish APL Group has started holding meetings twice a year too – and we are running the first Dyalog North America meeting in Princeton. The FinnAPL meeting was a few weeks ago; this week we are wrapping up the rest in a whirlwind tour of no less than five one-way trips to get us to Princeton late on Saturday. 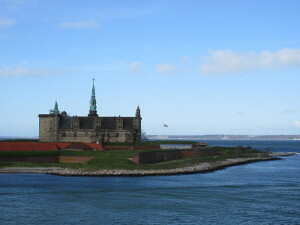 We were off to a beautifully easy start on Monday evening, with the 20-minute ferry ride from Helsingør, where Gitte Christensen and I live, to Helsingborg in Sweden. 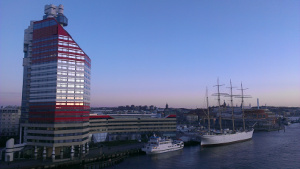 From here it was 1 hour and 45 minutes by snabbtåg (train) to Göteborg, where we arrived just in time for a run at sundown, over the bridge across the Göta river, from which the second image was taken. 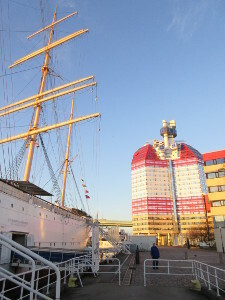 Our hotel, the beautiful ship Barken, is on the right, and the conference venue, Läppstiften (the Lipstick), a very short walk away to the left. 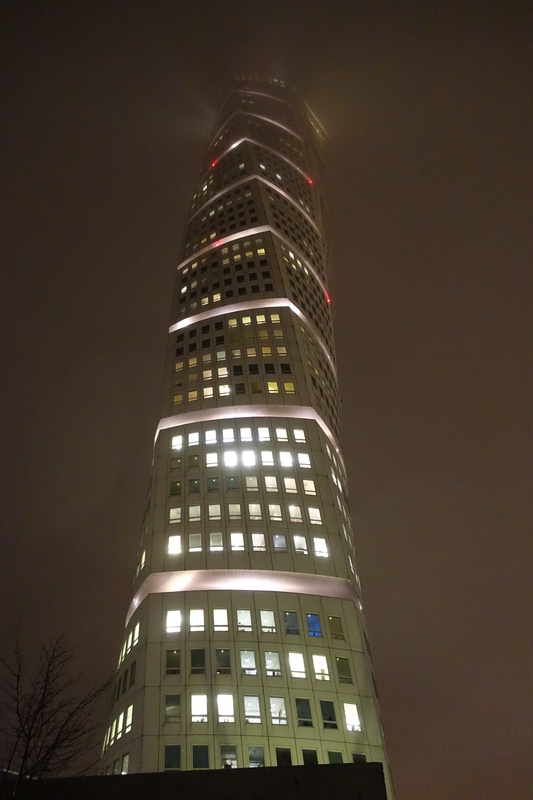 After a good night’s rest we were welcomed on the 21st floor of the Lipstick by Lars Wenztel of Aplensia, our host for the day. Lars opened the meeting with a talk about the efficiency of using arrays to do product configuration and production planning at Volvo Car Corporation, which is also located just across the river from the meeting site. He mentioned how his team had been working to improve performance, and I would like to take that opportunity to remind you all to send us benchmarks that are representative of your most performance-critical application components so that we (Dyalog) can help you to speed things up. I was up next with an updated Road Map presentation and demos of the new JSON parser and external workspaces (spoiler alert: Germans and North Americans will see something very similar later this week 🙂 ). The afternoon was full of interesting presentations on the use of APL, with Gert Møller from Genokey in Denmark as the last presenter. He brought the day to a close with his presentation of ongoing work on the application of array-based logic to the problem of reducing the cost, increasing the effectiveness of – and reducing the side-effects that patients are likely to experience when using – new drugs. And guess what…he mentioned that performance was important, too. 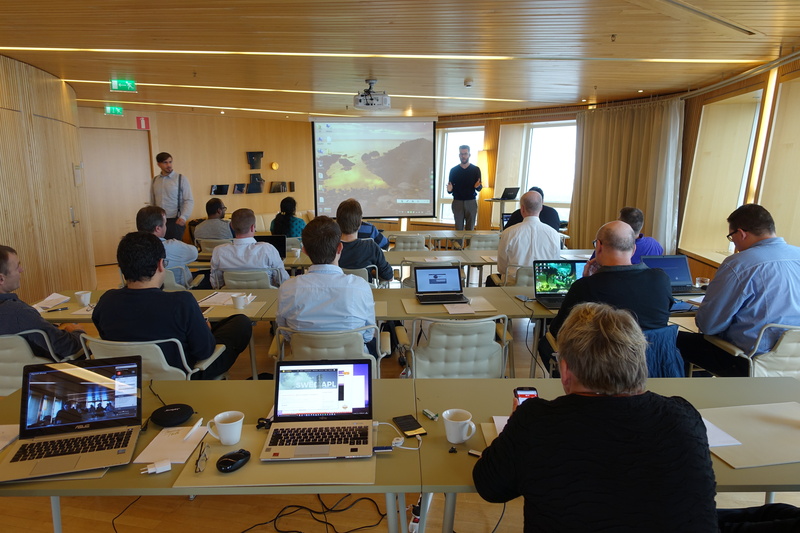 Tuesday was a wonderful day in the company of some very lively Swedish APL Users. It is wonderful to see how they have put APL to use in important production planning applications at some of Sweden’s largest manufacturing operations, and the rapidly-growing bio-informatics sector was also well represented. 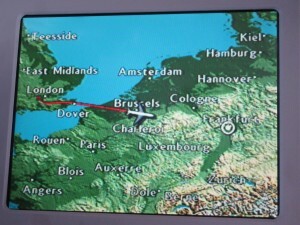 We ended the day deciding to meet again on November 11th, with a target focus of web servers and services. 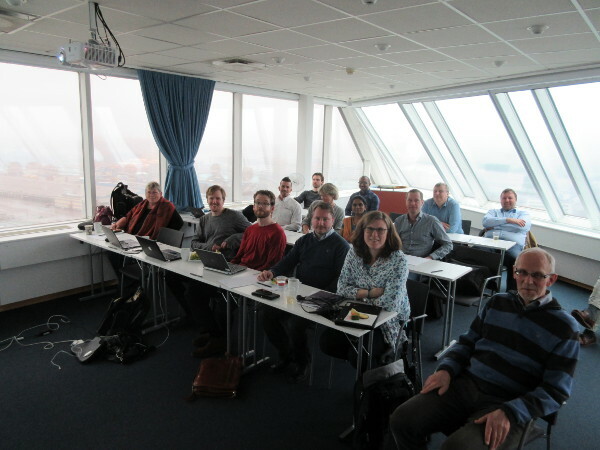 Nearly everyone present had either experience of or plans to implement web-based solutions in APL; there will be code reviews and perhaps even have some hands-on coding sessions next time! The original plan was to take the train and ferry again and have a night in our own beds, but an opportunity to interview two potential candidates for our current job opening had appeared and, since it would be 2-3 weeks before we were back in the UK, we decide to grasp it. 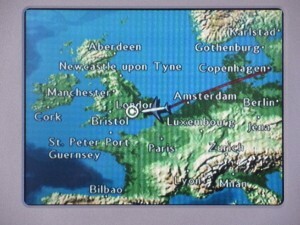 One of the benefits of having a large collection of air miles is that you can spend them on last-minute one-way trips that would otherwise cost a fortune. So instead of hopping on the train, we found ourselves on the airport bus and then a BA flight to Heathrow.